It wasn’t the quake that did most of the killing in Haiti. The blame for the 7.0-magnitude earthquake‘s staggering death toll—which is expected to rise to over 200,000—lies at the feet of that country’s construction industry, says a Berkeley, Calif., engineer. Eduardo Fierro, a Berkeley seismic engineer who arrived in Haiti shortly after the earthquake, told a University of California audience that shoddy materials, unacceptable building practices and a lack of government oversight caused the vast majority of the deaths there. 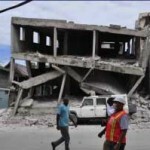 Fierro’s presentation was the first public technical assessment of the Jan. 12 Haitian quake. “My God, this was not an earthquake disaster — it was a disaster caused by the construction industry in Haiti who didn’t know anything about building codes,” Fierro said on Jan. 26 to a group of students and professionals at the Pacific Engineering Earthquake Research Center on the UC Berkeley campus. Fierro’s remarks were widely published in the local, Northern California press, including the San Francisco Chronicle, Oakland Tribune and Contra Costa Times, but made little impact in major, mass-market media such as the New York Times. Among the most remarkable scenes in Port-au-Prince, Fierro said, is that he saw just one building that remained undamaged by the earthquake, and that was the American embassy. In an interview with the Chronicle’s David Perlman, Fierro said that was the only structure whose construction methods embodied the most modern building codes enforced in American cities. He said most of the concrete buildings had steel reinforcement bar—rebars— that were drastically inadequate, and many structures had none at all, such those buildt with hollow cinder block. Haiti, he said, has no government building codes whatsoever. By contrast, the 1989 Loma Prieta Earthquake in the San Francisco Bay Area, which also measured 7.0 on the Richter scale, killed 63 people throughout northern California, injured 3,757 and left some 3,000-12,000 people homeless, according to data gathered by Wikipedia. Twenty years later, Bay Area builders and engineers are still working on retrofiting many structures, such as the Oakland-San Francisco Bay Bridge. If Haiti is to recover, Fierro said, its government will have to take the lead in establishing building codes, then enforcing them. After all, it wasn’t the quake that did the killing. It was lack of construction standards.